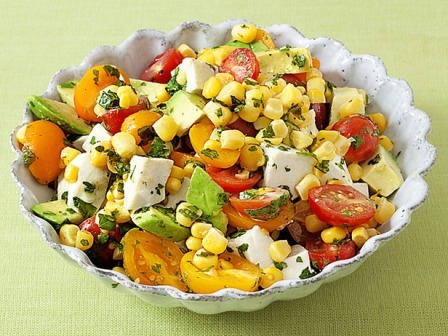 Now that we have a bit of sunshine and hot weather - it's time to explore some new summer salad recipes. I actually ran across most of the offerings below last fall, but wanted to hold off until the spring/summer season when produce is at its freshest. Aida's Corn, Tomato and Avocado Salad came to my attention while watching the Food Network. 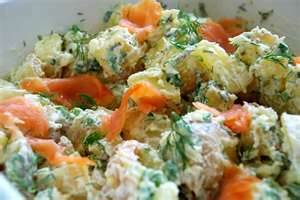 I liked the fact it was marinated with no lettuce, spinach or cabbage, so would hold up well for a make the night before dish, a picnic, or to enjoy as leftovers the next day. Most of the other recipes were from an article in The Vancouver Sun. There are a few, however, I have forgotten the source. Now that summer is finally arriving in Vancouver, the time seemed right to offer this assortment. The first salad is one I tried and enjoyed immensely, BUT it is unusual. Best to serve it when you have guests with a wider palate who like new experiences. It also needs VERY fresh corn on the cob to start with, so use it as a seasonal offering when local corn hits the market. The other recipes are totally untested so be sure and let me know what you think if you try them. These recipes are being worked into my menus over the next 3-4 weeks so I will update with comments (or remove if a disaster) as I go along. In a small saucepan, combine the sugar, vinegar and oil. Bring to a boil over medium heat. Cook, stirring often, 5 minutes or until sugar dissolves. Remove dressing from heat and cool 30 minutes. In a large bowl, combine remaining ingredients. Gently stir in dressing. Cover and chill salad for 8 hours. Serve with a slotted spoon. This salad may be stored in an airtight container in the refrigerator for several days. In a large bowl, combine all the ingredients. Cover and chill at least 1 hour before serving. If you are not using day-old bread, dry the bread slices in a 300-degree oven for 20 to 30 minutes. This salad is best served immediately. In a large bowl, place the tomato chunks and sprinkle with 1/2 teaspoon (2 mL) of salt. Set aside for 15 minutes. Place the bread in a large serving bowl. Add the cucumber, red pepper and red and green onions. Add the tomatoes with any juices. 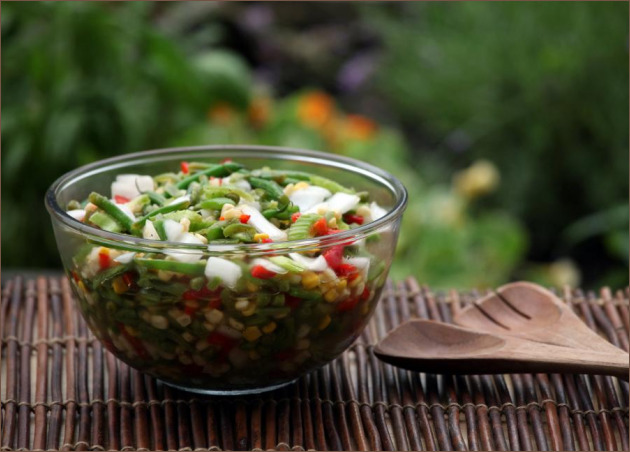 Sprinkle salad with herbs and season with sea salt and freshly ground pepper to taste. In a small bowl, whisk together all the vinaigrette ingredients until the mixture emulsifies. 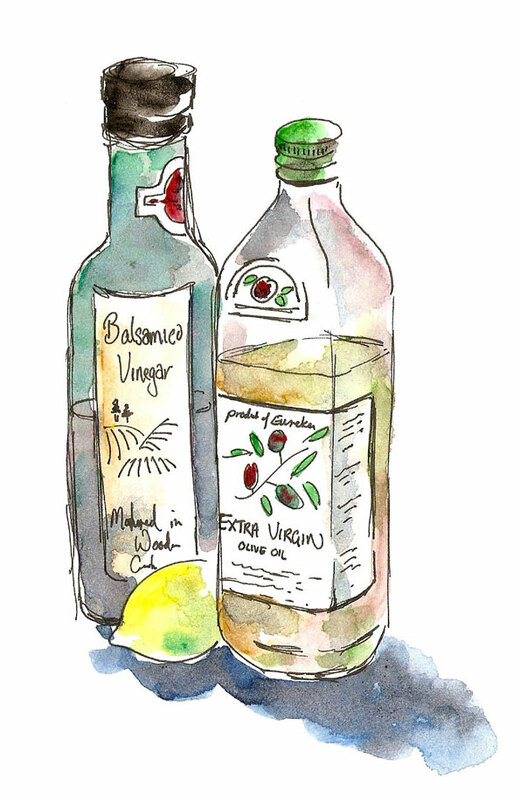 Drizzle the vinaigrette lightly over the salad and toss gently to coat. Use only enough vinaigrette to coat all the ingredients. Leftover vinaigrette will keep in the refrigerator for several days. 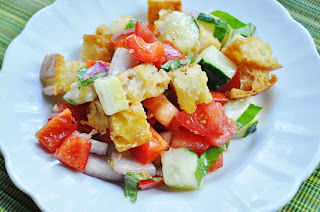 Season the salad with salt and black pepper to taste and serve. Place the potatoes in a large pot, then add enough cool water to cover by 1 inch (2.54 cm). Add 1 teaspoon (5 mL) of salt, then bring to a boil and cook for 10 to 15 minutes, or until just tender when pierced with a fork. Drain the potatoes and spread out on a rimmed baking sheet. Sprinkle with the vinegar and set aside to cool. Meanwhile, in a large bowl, combine the yogurt, sour cream, scallions, mustard, dill, thyme and garlic powder. Season with salt and pepper, to taste. Stir in the pimentos, artichoke bottoms and celery. Once the potatoes have cooled, gently stir in until thoroughly coated. Cook the couscous according to package directions. Allow to cool. 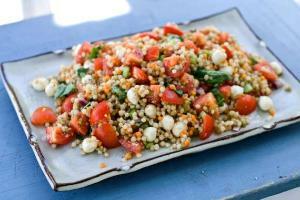 In a large bowl, combine the cooled couscous with the red onion, garlic, celery, tomatoes, basil, Parmesan, mozzarella, olive oil and vinegar. Stir to combine, then season with salt and black pepper. The salad can be served immediately, but the flavours improve if it is allowed to sit for 30 minutes. Combine the beets, dill, olive oil and balsamic vinegar in a bowl. Season with salt and pepper. Garnish with the seasoned sour cream. Mix all the ingredients in a bowl. Store in an airtight container in the refrigerator for up to 3 days.